Learn the Navigated METS coned hemi-pelvis endoprosthesis (Stanmore) with Avantage dual mobility acetabulum (Zimmer Biomet) and modular proximal femoral endoprosthetic replacement with trochanteric reattachment surgical technique with step by step instructions on OrthOracle. Our e-learning platform contains high resolution images and a certified CME of the Navigated METS coned hemi-pelvis endoprosthesis (Stanmore) with Avantage dual mobility acetabulum (Zimmer Biomet) and modular proximal femoral endoprosthetic replacement with trochanteric reattachment surgical procedure. Computer navigated tumour surgery is regarded as one of the major developments in the field of orthopaedic oncology of the past decade. Navigation permits pre-operative three-dimensional resection and implant planning to be combined with intra-operative imaging. These advantages have resulted in its growing incorporation into routine practice since its first application in 2004. In this case I describe the use of navigation to aid endoprosthetic reconstruction of the pelvis and acetabulum using the Stanmore coned semi-pelvis (‘ice cream cone’) endoprosthesis (http://www.stanmoreimplants.com/downloadpdfs/06.METS%20Coned%20Hemi-Pelvis%20Information%20and%20Surgical%20Procedures%20(File%20Size%20-%201MB).pdf). This implant is ‘off the shelf’ and utilised in orthopaedic oncology to reconstruct the peri-acetabulum. Pelvic anchoring is provided by a fixed hydroxyapatite stem which can augmented with bone cement and reinforced with screws to achieve a stable acetabular reconstruction. Having created the acetabulum, a suitable acetabular cup is cemented into the cone for use with a total hip replacement. 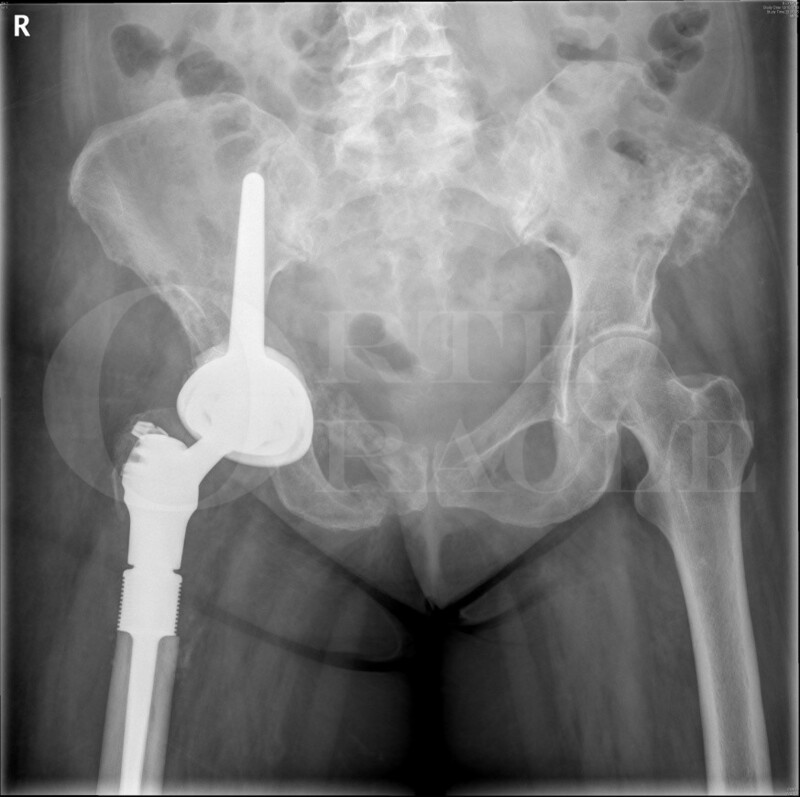 Recent evidence has confirmed that dual-mobility articulations reduce the risk of dislocation with hemi-pelvic endoprostheses, so this case describes the use of a cemented dual-mobility acetabular cup and bearing. Metastatic bone disease commonly presents to the orthopaedic surgeon. Bone is the most common site of metastasis. For example approximately 60% to 70% of patients with breast cancer develop bone metastases during the course of their disease. Skeletal related events (SREs: pathological or impending fracture, hypercalcaemia, spinal cord compression, severe pain) may require surgery and/or radiotherapy to palliate pain and to maintain both the capacity to walk and quality of life.